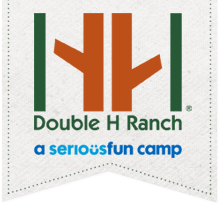 In the Spring and Fall, the Double H Ranch provides families with the opportunity to participate in camp based programming for a weekend. All programs offered at Double H are free of charge to the campers and their families. The overall goal of year-round programming is to continue to provide or meet respite needs while spreading the mission of Health and Happiness to children and families dealing with a life-threatening illness. The goal and purpose of each family weekend is to share the joy and magic of Double H. Families challenge themselves by going on the High Ropes course or challenge each other to catch the most fish at the waterfront. Through the support of volunteers and staff, families participate in camp activities, sing songs around a campfire and take a few days out of their lives to just relax and enjoy time with each other. In order to serve as many campers as possible, we ask that families attend only one Spring or Fall weekend program per year. Camp Bravehearts is an oncology camp for women run in collaboration with the Bravehearts Organization. There is a focus on outdoor activities and physical challenges, including high ropes and horseback riding. For the calmer spirits, there are also crafts, water aerobics, and nature walks. Women are encouraged to grow in self-confidence and friendship as they share life experiences before and after treatment. » Visit Bravehearts Camp to learn more! The Hem/Onc weekend program is designed for campers (ages 5 – 21) who have a diagnosis of Cancer or a Blood Disorder. Families have the opportunity to spend a weekend in the Adirondacks, taking on all the fun camp activities together. The Caring and Sharing Diabetes weekend program is designed for campers (ages 5 – 21) with Type I Diabetes, and is run in collaboration with the PumpWear Company started by Julie DeFrucio. Families have the opportunity to learn about Type I Diabetes while enjoying the weekend at camp together. Cindy’s Spring Comfort Camp is designed to serve campers (ages 6 – 17) that have a parent or sibling dealing with a life-threatening or chronic illness, and is run in collaboration with The Cancer Center at Glens Falls Hospital. Campers will participate in camp activities, attend professionally guided support sessions, and meet others who have shared a similar experience. New in 2019! The General Family Weekend is designed for campers (ages 5 – 21) who have a qualifying diagnosis of Cancer, Collagen Vascular Disease, Hemophilia/von Willebrands, Inflammatory Bowel Disease, Immune Disorder/HIV, Mitochondrial Disease, Neuromuscular Disorders, or Sickle Cell Anemia. Families have the opportunity to spend a weekend in the Adirondacks, taking on all the fun camp activities together. This weekend offers families who have lost a child due to life-threatening or chronic illness an opportunity to enjoy a long weekend together at camp. We partner with Albany Medical Center and Rosie’s Love Organization to help families reflect and remember their loved one, closing the weekend with a memorial ceremony for family members. The Mitochondrial/Journey’s weekend program is designed for campers (ages 5-21) who have a Mitochondrial Disorder or are involved in the Journey’s Program at Albany Medical Center. Families have the opportunity to spend a weekend in the Adirondacks, taking on all the fun camp activities together. This weekend is an oncology camp for women run in collaboration with the Bravehearts Organization. The schedule includes crafts, nature hikes, and a Halloween costume party, among other health and wellness activities.Women are encouraged to grow in self-confidence and friendship as they share life experiences before and after treatment. This weekend is designed for campers who have Spina Bifida, and is run in collaboration with The Spina Bifida Association of Northeastern New York. Questions? Please contact our Admissions Department at 518-696-5676. Volunteer as a Family Pal! Family Pals spend a weekend at Double H Ranch paired up with a camper and their family and accompany them as they rotate through daily programming. Family Pals work sleep over at Double H Ranch to help facilitate evening activities. For some of the family weekends we work with other non-profit organizations to provide programming to a specific group, to learn more about these organizations please visit their websites.